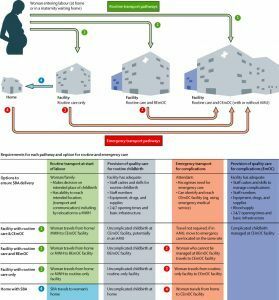 The Lancet Maternal Health Series published in September 2016 contains six papers highlighting the importance of improving access to high quality maternal health care for all women across the globe. In paper 3, “The scale, scope, coverage, and capability of childbirth care,” Campbell and colleagues examine the adequacy of global intrapartum care with a particular focus on who helps women deliver and where those deliveries take place. They also recommend strategies for improving access to high quality maternal health care. 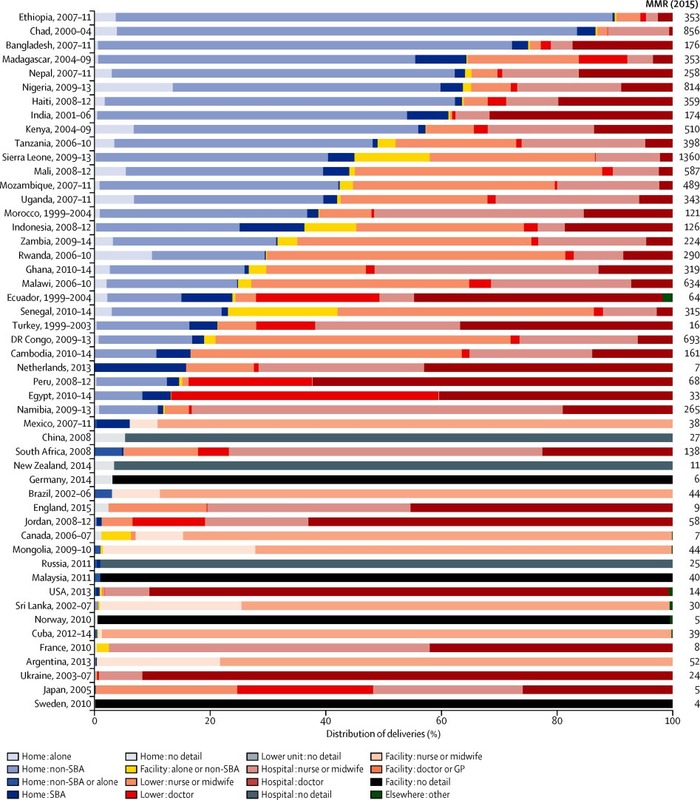 Where and with whom do women deliver? Every woman should be able to deliver with a skilled birth attendant who has both the knowledge and technical skills necessary to provide appropriate, timely health services and the ability to communicate in a caring, respectful manner. 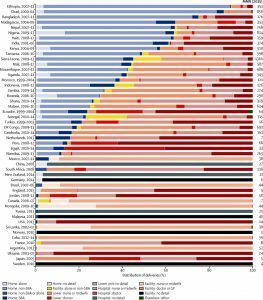 Maternal mortality ratios remain high in many countries despite high coverage of skilled birth attendance, suggesting that this indicator is limited in its ability to measure quality of care. Because there is not a standard definition for the term “skilled birth attendant,” providers labeled as such may not be able to deliver essential services such as manually removing the placenta after delivery. Shortages and poor distribution of the global health workforce has resulted in 64 countries having fewer than 23 skilled health providers per 100,000 people, failing to meet the minimum critical threshold calculated by the World Health Organization. Based on the authors’ review of the evidence, the majority of women who deliver at home in low- and middle-income countries (LMICs) do not have a skilled birth attendant present. Among women who deliver in facilities and hospitals, the type of provider (doctor or nurse/midwife) varies. In some cases, women deliver at facilities without a skilled attendant or at home with no one present. Health facilities vary widely in their capacity to provide high quality intrapartum care. The authors found that facilities in LMICs are generally better equipped to offer routine care than emergency obstetric care (EmOC). In Kenya, only 16% of facilities are capable of offering emergency obstetric services. Basic infrastructure is also lacking: 66% of hospitals in sub-Saharan Africa lack electricity, and many facilities in low-resource settings lack adequate sanitation and clean water. Similar to skilled birth attendance, facility-based delivery does not necessarily indicate high quality care. In addition to shortages in the health workforce, many countries do not have enough fully functioning EmOC facilities to serve the population of pregnant women. Furthermore, emergency transport systems, including the availability of reliable ambulance services, are often insufficient for transporting women with obstetric complications to an EmOC facility. The authors propose a number of strategies for addressing access and transport, including expanding the use of maternity waiting homes, developing governmental programs for subsidizing women’s transportation costs for delivery and building alongside midwifery-led units. The authors illustrate that facility-based delivery does not necessarily coincide with skilled birth attendance and vice versa. Encouraging women to deliver in facilities that they cannot access or that do not have the capacity to provide high quality maternity care is unreasonable and unethical. In order to improve maternal health outcomes around the world, the global maternal health community must take into account all of the complex, interconnected factors that influence where and with whom women deliver their babies, as well as the quality of care received. 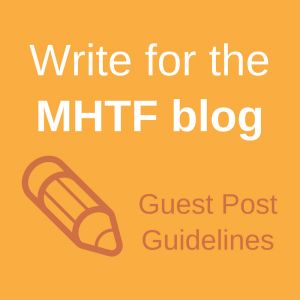 Check out other posts in The Lancet Maternal Health Series on the MHTF blog, and subscribe to receive the next post in this series in your inbox! 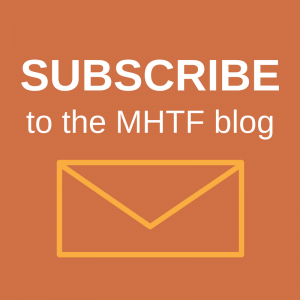 Learn about the skilled birth attendant indicator and other measures for quality of maternal health care. Read more about the barriers women face trying to reach a health facility for delivery. Photos: The scale, scope, coverage, and capability of childbirth care. The Lancet Maternal Health Series, 2016.